In celebration of National Canned Beer Day, the anniversary of the first canning of beer in Richmond on January 24, 1935, Hardywood, Old Dominion Mobile Canning, and Brown Distributing have teamed up to bring “Day Fresh” cans of Cream Ale and The Great Return to various restaurants and shops around the city. Beer in a can, from whence it all began! We have meticulously timed our brewing schedule, enlisted the help of all our employees, our friends, and some amazing volunteers, bought a ton of coffee, set our alarms for entirely too early in the morning, even put out a silly press release to prepare. All for you! 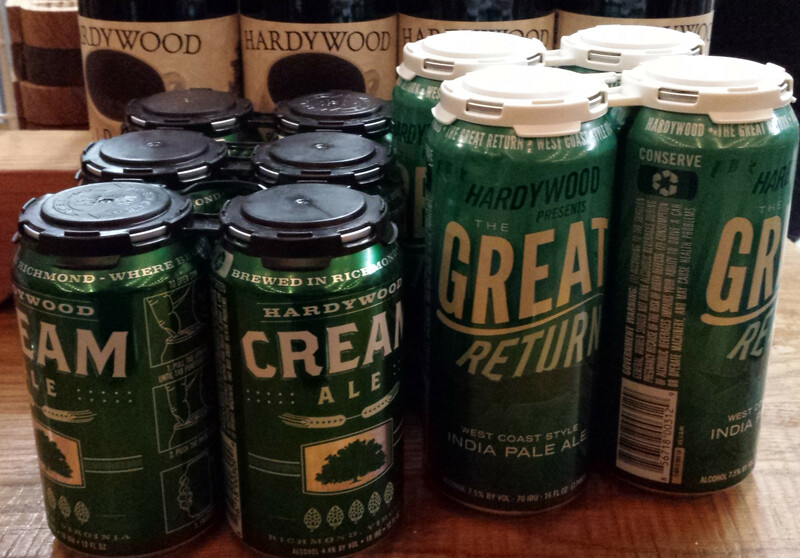 We will be canning fresh batches of Hardywood Cream Ale and The Great Return in the early morning hours of January 24th. Our distributing partner, Brown Distributing, will pick up pallets of these cans, an after processing them, will immediately begin selling them into the market, allowing customers to enjoy our beers the freshest way possible; the day they were canned. Head out to your favorite watering hole and ask for day fresh Hardywood cans, or join us for a party at the brewery that evening, where Old Dominion Mobile Canning will be hosting a canning seminar. What better way to enjoy the massive loads of Citra and Simcoe in The Great Return than trying it within hours of it being lovingly canned! Grapefruit, melon, bold resiny pine, we’ve got it for you! Want to impress your friends with how amazing your craft beer street cred is? Instagram or tweet a photo of your can with its canning date printed merely hours before! #dayfreshbeer! And if for some reason you aren’t able to get out on Friday to enjoy some of these cans, fear not, because on Saturday, they will be 1 day old! So why decide to create this event in the middle of the winter? Is it because we love the cold? Maybe. Because it’s Janaury and we felt like reviving a local holiday? Possibly. Because we love Richmond and want to warm your hearts? Absolutely! Gottfried Krueger Brewing Company had been brewing beer since the mid-1800s, but had suffered from Prohibition and worker strikes. When The American Can Company approached with the idea of canned beer, it was initially unpopular with Krueger execs, but American Can offered to install the equipment for free; If the beer flopped, Krueger wouldn’t have to pay. G. Krueger Brewing must have felt it was a huge gamble to be first out with canned beer. It was too big a gamble to release the product in their regional market, instead, Richmond, Virginia was decided upon as a test market. On January 24, 1935, canned beer went on sale. Two brands were sold, Krueger’s Cream Ale and Krueger’s Finest Beer, marking the birthday of the beer can. The 2,000 cans of beer were given to faithful Krueger drinkers in Richmond; The public loved it, with 91% giving it a thumbs up, and 85% saying that it tasted more like draft than bottled beer1. Reassured by this successful test, Krueger gave canning the green light, and history was made. Compared to glass, the cans were lightweight, cheap, opaque, and easy to stack and ship. Unlike bottles, you didn’t have to pay a deposit and then return the cans for a refund. By that summer Krueger was buying 180,000 cans a day from American Can2, and other breweries decided to follow. Beer in a can became the greatest thing since sliced bread, which incidentally was only seven years old at the time. When we decided to create our first canned beer, we thought it was only right to pay tribute to the original canned beer. Hardywood Cream Ale is an unfiltered example of the style that embraces its east coast roots with an unbelievably smooth body and a refreshingly clean finish from extended cold conditioning in our lagering tanks. With every can we create since that time, we continue to honor and pay homage to those brave souls who gave us the beer can! Raise a can to RVA, where the canned beer revolution began! Celebrate your beer history by cracking open a cold one with us! Cheers!